Jug Face. 2013. Directed & Written by Chad Crawford Kinkle. Starring Sean Bridgers, Lauren Ashley Carter, Kaitlin Cullum, Sean Young, and Larry Fessenden. Modern Distributors. When I’d first heard the premise of Jug Face I absolutely knew I wanted to see it. Then of course I realized both Sean Bridgers and Larry Fessenden were set to be in the film – I was hooked. I’ve always been a fan of Fessenden in particular as a filmmaker, however, he can also be a treat in front of the camera. Bridgers came to my attention first through Deadwood, and of course more recently I’ve enjoyed his work in The Woman which also included one of the stars of this film I haven’t seen much of: Lauren Ashley Carter. These three in particular, along with a couple others (such as Sean Young whom I’ve enjoyed before in Blade Runner and Wall Street), really do a great job acting here. One of the pitfalls in many horrors, whether they be older or more modern, is that they’re often not well acted. Sometimes, if they plot is strong enough and the writing is tight, a horror can get by without stellar acting. However, if the plot or writing can’t cut the mustard so to speak then a horror really has to really on some decent, or better, acting to draw people in. If not it’s all for bust. Well Chad Crawford Kinkle’s Jug Face is packed with both great acting and tight writing. The story is a peculiar and unique one, which is something I loved right off the bat about Jug Face. A young girl named Ada (Carter), pregnant with her brother’s child, lives in a backwoods town where a pit is worshipped as a healing power for the whole community. In turn, one of the locals Dawai (Bridgers) is spoken to by the pit and told who is to be sacrificed. He then creates a face jug for each person. This person is given to the pit. One day, however, Ada finds a jug with her face on it, so she hides it. And this is the plot of Jug Face. It is a fresh perspective on horror. It isn’t the typical backwoods slasher or “cannibals in the woods” type trope in the genre. This is a great way to use the backwoods setting and create something new to give to the world of horror. In my personal opinion, Kinkle has a great talent for the strange. For the most part I enjoyed the whole film from start to finish. I only had problems with one part of the plot. I don’t want to ruin anything, so I’ll just say that it’s a little more than we need in terms of the supernatural – if the film didn’t have this little added part, nothing would have suffered. The pit itself is enough for the film. It’s mysterious to a certain extent. But this part (I’ll say it involves a ghost) just sort of feels forced. Ada, as a character, could have gone through the motions she does without Kinkle having to resort to a ghost as motivation. I love the character of Ada, and maybe I’m giving her too much credit, but I feel like she would have decided to do what she does without being lead by a ghost. It felt maybe a bit too expository to have the ghostly aspect in there. Though it doesn’t ruin anything. Kinkle still tells a fascinatingly weird tale. As for the Blu ray release, I am highly pleased. The picture, of course, is absolutely fantastic. There are some wonderful shots in this film that ought to be enjoyed in the highest definition. It’s really a visual treat. The special features for Jug Face also surpassed my expectations. 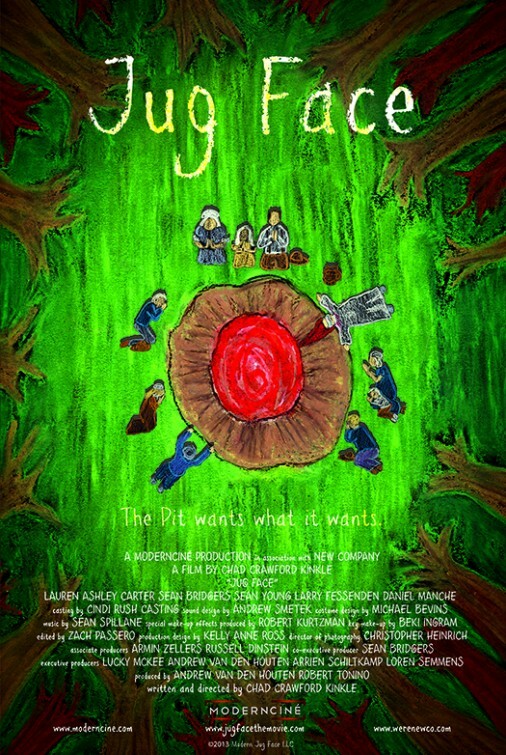 Not only is there a great little documentary feature titled “The Story of Jug Face” which runs about half an hour (includes cast and crew interviews and some behind-the-scenes filmmaking stuff that I loved! ), it also came with Kinkle’s short film Organ Grinder. This little horror short, clocking in just past the six-minute mark, is a real shocker. I loved every single second. It’s about a woman whose mother is killed, after which she seduces a man possessed by a demon for purposes uncertain. We do find out her purpose near the end. What a great little horror. I highly recommend seeking it out. It makes this Blu ray release really worth it. Such a great addition to the film. You get to see Kinkle’s sensibilities in the short film coupled with those of Jug Face, and this provides a bit more insight into him as a filmmaker. Great stuff. As a film, I have to give Jug Face a 4 out of 5 stars. It is a great movie with some interesting performances. In particular, Bridgers really does a fantastic job with the character of Dawai. Carter also does great work, as a flawed female character who is interesting, as well as strong. However, the movie is tripped up a little with the ghost stuff. It would have benefitted to cut that stuff out, and leave the film’s supernatural aspects to the pit, its mysterious powers, the cult-like community. All that worked. That being said, once again, this does not ruin anything. It’s merely a part of Jug Face I don’t particularly care for. Other than that, it’s amazing. For the Blu ray release this is absolutely 5 stars. A wonderful documentary, which includes Kinkle himself talking about how he came up with the story and other bits and pieces about the process of making the film itself. Also, the fact Organ Grinder is on here makes this a must have Blu ray. If you like unique horror, this indie film is worth your time. Kinkle has a great eye for horror. His story is fresh, and doesn’t get bogged down with a lot of the typical trash in the backwoods horror sub-genre. I highly recommend it. You won’t be disappointed if you’re into something a little different and outside the run of the mill.